To help you bring more technology to class! S.A.M.R. 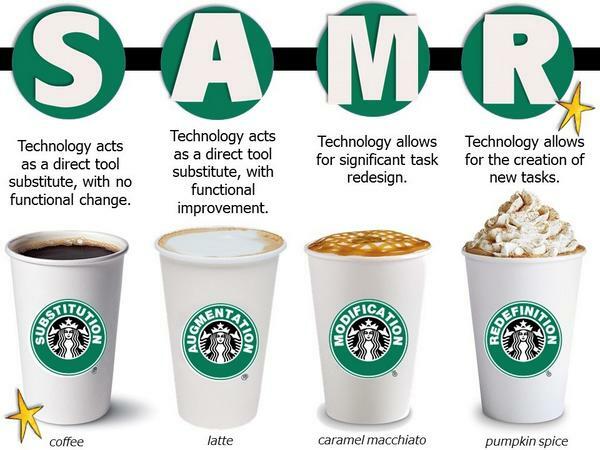 stands for SUBSTITUTION, AUGMENTATION, MODIFICATION and REDEFINITION and is a model that shows the stages of integration of technology in teaching and learning. It links how technology is used in the classroom with the desired outcomes for student learning. It is an effective tool for teachers to transform learning using current technology. But the end goal is Transliteracy! Each step listed in this infographic are ways to reach transliteracy. I want to make a note that the art of using more technology is not a destination. It is a process. Some things you use may be low on the tech side but are essential to teaching. The trick is to know what is available and using this knowledge to serve your students the best way you can. That is why you have been chosen to be a teacher. Welcome to the greatest calling! Click on the DeLorean to go to my blog.